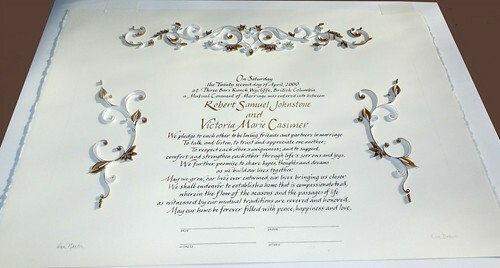 Recently I was commissioned to quill a certificate for a couple who will be celebrating their 15th anniversary in the spring. The wedding color palette was gold and white with yellow accents, and the bride carried yellow lilies which she asked me to include in the design. 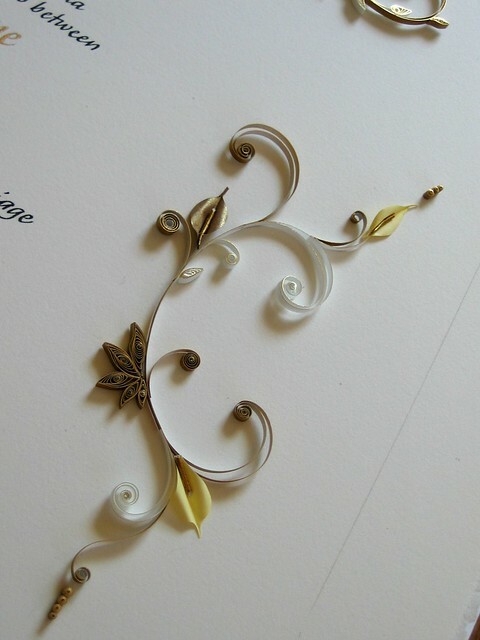 She sent a scan of their reception card to use as inspiration. 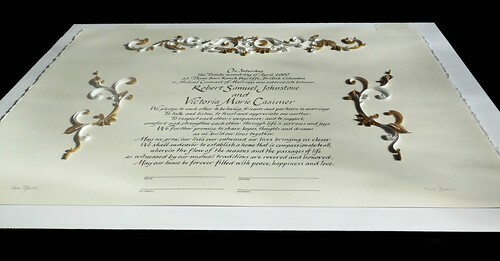 It's such a help to have a design to refer to as I begin a certificate, ketubah, or framed wedding invitation. Calligrapher and fine artist Riva Brown of Living Letters Studio did the lettering in black ink with shimmering gold gouache touches on warm-white, 100% cotton paper by Arches, a French paper mill. The piece measures 15 x 22 inches; this is half the size of the marriage certificates she and I usually collaborate on because an anniversary piece doesn't require penciled lines for guest signatures. 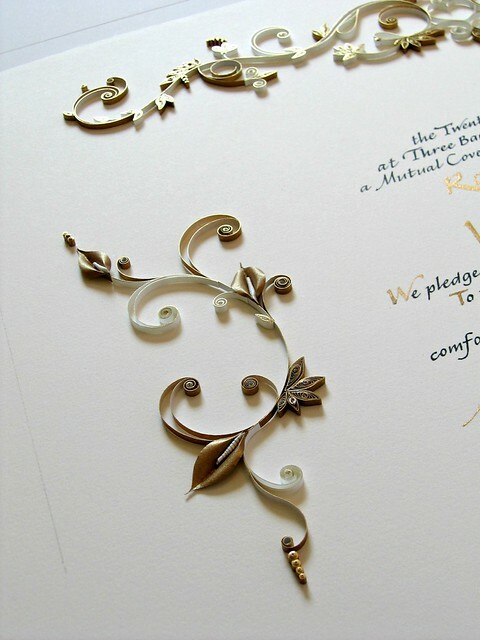 All of the quilling was done with metallic-edge papers from JJ Quilling Design. 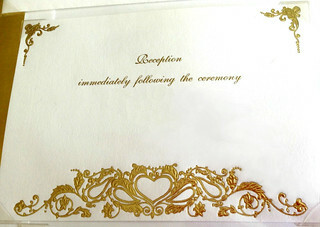 I used gilded white and a new-to-me type - pearlized gold on one side and white on the other. It has a gilded edge as well and shines beautifully! 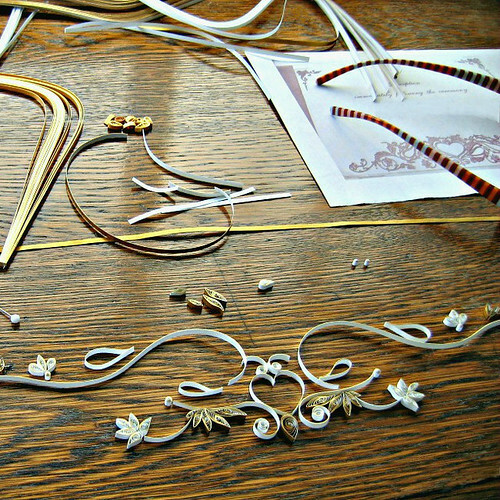 ...and experimented with yellow and gold metallic sculpture papers from Custom Quilling. 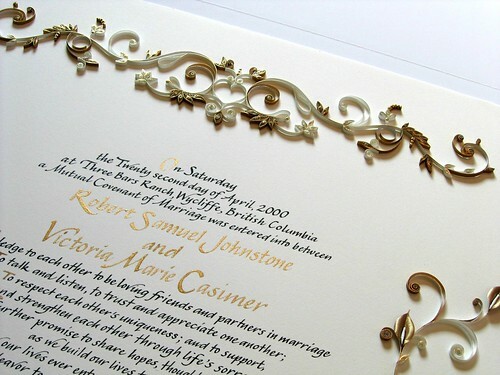 The client and I agreed on the golden peace lilies which I nestled into each side motif composed of scroll work and inspired by the reception card's corner design. 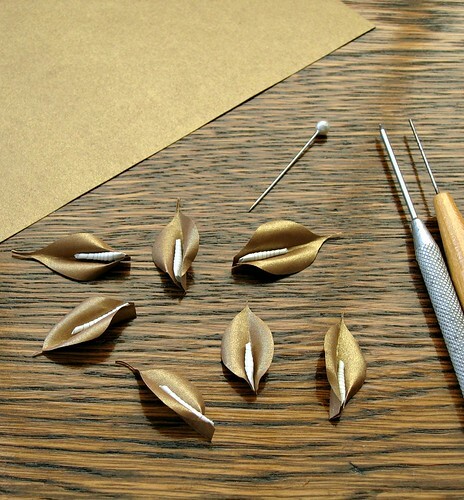 I used my quilling tool and a paper piercing tool to sculpt the paper and a straight pin to apply glue to the rolled white stamens. After the client approved the completed layout, it was time to do the final gluing. There's no room for error, so I measure and measure again to make sure everything is perfectly balanced. 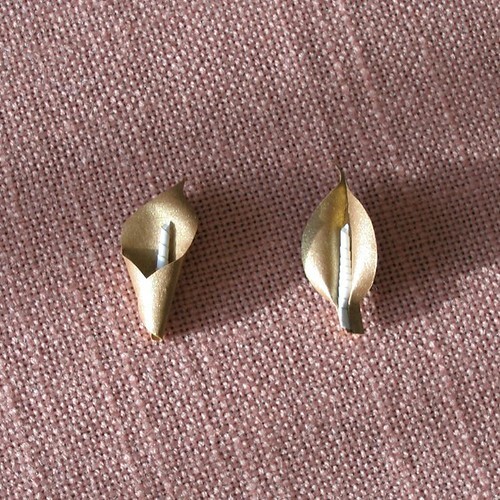 Tweezers and a straight pin are essential tools. I mark where a coil will be placed with the pin tip and then use it to dot a miniscule amount of acid-free glue to the coil's underside. Holding the coil steady with tweezers, I adhere it to the certificate. No matter how many times I do this, I have to admit it's always a thrill to see the final design take shape. The certificate was featured first on Oh So Beautiful Paper. It's stunning. What a treasure for them to have! Truly gorgeous! Your clients will be so pleased with your design - it's perfect in every detail. I love those lilies! SO elegant!! Ann this piece is go beautiful I am at a loss of words. 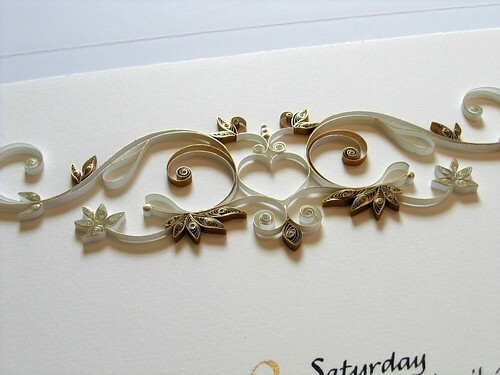 So intricate and delicate .Love it!! This is so very beautiful. I am in awe of the painstaking attention to detail. Thank you for giving us a peek into your process. Aw, you are all so nice, thank you. To say you are an artist is a gross understatement! I don't think there is a word good enough to describe what you do. Thank you for sharing. So very elegant and graceful! Beautiful work - thanks for sharing your process! Thank you eli (belatedly!) and Deb. I'm glad you like it.